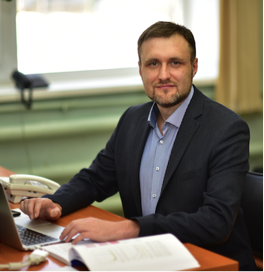 Yuriy received his PhD degree in Fluid Mechanics at Kutateladze Institute of Thermophysics SB RAS, Novosibirsk in 2016. Title of the thesis was “Convective condensation of vapor and evaporation of a liquid layer under gas flow in confined conditions”. His research is in the field of the hydrodynamics and heat-and-mass transfer in two-phase flows under phase change conditions. Droplet evaporation under gas flow. Heat transfer, dynamics and crisis phenomena in evaporating liquid films. Thermocapillary convection in liquid films. Filmwise and dropwise vapour condensation in tubes and on finned surfaces. Hydrodynamics and heat and mass transfer in two-phase flows. Liquid and gas hydrodynamics under microgravity conditions. Thermocapillary deformation and rupture in locally heated horizontal fluid layer. 2003 Masters of Science in Mathematics majoring in “Applied mathematics and informatics”, June 28, 2003, Novosibirsk State University, Russia. Thesis: “Mathematical model of stationary vapor condensation on curvilinear surface taking into account heat conductivity in the condenser wall”. 2001 Bachelor of Science in Mathematics majoring in “Theoretical and Applied Mechanics”, June 28, 2001, Al-Farabi Kazah National University, Almaty, Kazakhstan. Thesis: “Investigation of mathematical pendulum with variable mass”. Research interests: Нeat transfer enhancement, phase change, two-phase flow, filmwise and dropwise condensation, finned surface, hydrophobic surface, surface tension, capillary pressure, local heating, thin liquid films, evaporation, convection, thermocapillary effect, cooling of micro-electronics, high heat flux, wettability, nano-structured surfaces, experimental works in ground and microgravity conditions, droplets. RSF, 15-19-20049, 2014-2017, «Transport processes in multiphase systems with phase transitions», Principal investigator, Supervisor of experimental reseach. RSF, 18-79-10258, 2018- present, The use of microstructured surfaces for heat transfer enhancement in thin liquid films moving under the action of a gas flow in the minichannel, Principal investigator. RSF, 14-19-01755, 2013-2016, Transport processes in two-phase flows with contact lines in microchannels with respect to high-intensity cooling systems, Investigator. RFBR, 14-08-00163 А, 2014-2016, Theoretical and experimental study of the processes of heat and mass transfer in two-layer convection flows with evaporation, Principal investigator. RFBR, 14-38-50008 mol_nr, 2014, Experimental study of evaporation processes in a horizontal moving fluid layer partially open to a gas flow, Principal investigator. RFBR, 14-08-31559 mil_a, 2014-2015, Study of heat transfer and dynamics in sessile drops of fluid, Investigator. 14.616.21.0016, 2014-2016, Development of scientific and technological potential and experimental samples for high-performance two-phase cooling systems with natural circulation for space and transportation applications, Investigator. 14.604.21.0053, 2014-2016, Evaporative cooling system for high-performance new generation processors with forced coolant circulation, Investigator. 14.613.21.0011, 2014-2016, Creation of cooling technology for heat-stressed elements using single-component two-phase flows, Investigator. INTAS Young Scientist Fellowship, Ref. Nr. 04-83-2952, 2004-2008, Thermocapillary convection in a locally heated shear-driven liquid film», (IT SB RAS Russia; ULB-MRC, Belgium); Project leader. 2017 Diploma for scientific achievements and conscientious work, Kutateladze Institute of Thermophysics, Novosibirsk, 2017, Russia. 2012 Award for Best Poster presentation on Seventh International Symposium on TWO-PHASE SYSTEMS FOR GROUND AND SPACE APPLICATIONS, September 17-21, 2012, Beijing, China. 2006 Diploma of charitable foundation for the promotion of national science “Best PhD student of RAS”, 2006, Moscow. 2003 First Degree Award on the competition of Young Scientists, Institute of Thermophysics, Novosibirsk, Russia, April 2003. 2002 Second Degree Award on the VII All-Russian Young Scientists Conference “Actual Problems of Thermophysics and hydraulic gas dynamics”, Novosibirsk, Russia, April 2002.